The Texas Department of State Health Services confirmed the first ever human instance of Chikungunya in the state. A Williams County resident near Austin, Texas was diagnosed with the disease after returning home from a Caribbean vacation, reports the Dallas News. While chikungunya is rarely fatal, it can cause high fever, muscle and head aches, joint swelling and severe joint pain. 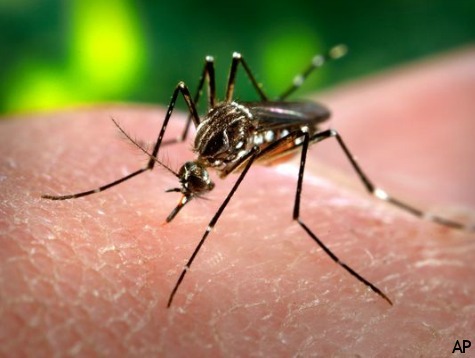 The virus does not spread from person to person contact, but instead is spread by mosquitoes who transmit the virus from human to human with a bite. According to the Dallas News, the type of mosquitoes that help spread chikungunya are common in Texas. Almost all of the 114 reported U.S. cases of Chikungunya have resulted from travel to countries where the disease has spread. According to the Pan American Health Organization, these countries include Puerto Rico, Cuba, Haiti and the Dominican Republic. State officials are encouraging travelers to use insect repellent every time they are outdoors, wear long sleeved shirts and pants and avoid standing water where mosquitoes can breed. So far, it is not likely that the disease will spread in Texas, however the disease’s prevalence in neighboring countries such as the Caribbean have many concerned. Those traveling back from the World Cup in Brazil are feared to bring the virus back with them. According to the Daily Mail, this fear prompted New York Senator Chuck Schumer to ask the U.S. Center for Disease Control and Prevention to issue a national health alert about the virus. “We have to prevent the spread of this virus before it reaches the United States in large numbers,” said Schumer. Other cases of the virus have been reported in Europe, Africa, and Asia. It was only earlier last year that the virus was found in the Americas on islands in the Caribbean, where it has since been spreading rapidly. Follow Patrick Kane on Twitter @PatVKane.